Featuring eight new Australian works speculating on how we might commemorate the climate change era, Climate Century is the culmination of a five-year process undertaken by Port Adelaide-based experimental art organisation Vitalstatistix. The three-week festival, comprising talks and workshops in addition to the main program’s suite of performances and installations, comes at a darkly propitious moment. Last month’s Intergovernmental Panel on Climate Change (IPCC) report warned we have only 12 years in which to cap global temperature rise at 1.5C, while last week over Thanksgiving the denialist Trump administration buried its own study — forecasting worsening and more frequent natural disasters and existential risks to human health and the economy. As I write these words in late November, Sydney is experiencing a ‘once-in-a-lifetime’ storm while, in Queensland, a similarly unprecedented spate of ‘catastrophic’ bushfires rages across the state. Of Raft of the Medusa’s first iteration, performed as part of Vitalstatistix’s annual artist hothouse Adhocracy in 2016, I wrote on my blog: “Intended by its creative team of Ian Sinclair and Loren Kronemyer to finally be performed on a life raft, the blackly humorous work is a commentary on rising sea levels, the titular watercraft — inspired by Théodore Géricault’s infamous depiction of the wreck of the French naval frigate Méduse — pitted against a dilapidated yacht in a ‘mid-apocalyptic’ contest.” The yacht, as it turns out, is the Archie Badenoch, an ex-naval cruise boat more used to hosting school groups than participatory performance art audiences. From the boat’s cramped cabin we witness Sinclair and Kronemyer adrift on a canoe, the performers swathed in thermal blankets as though anticipating rescue rather than any on-water skirmish. Has the Port, apparently second only to Bangladesh in terms of its vulnerability to climate change-induced sea level rise, flooded? Are these the only survivors? Eventually we draw up alongside them and they clamber aboard, dressed only in their underwear. I immediately note the red welts that cover their bodies, the source of which remains obscure — some kind of squid? — until Sinclair prostrates himself on the cabin floor and Kronemyer begins to apply suction cups to various parts of his body, a ritual evoking both the camp and the uncanny. They begin a conversation about failed relationships and use our suggestions to create a list, later transposed to Spotify, of good breakup songs (Cher, that ageless queer icon, features heavily). We fill a notebook with (un)romantic clichés: “it’s not you, it’s me; I need to find myself; this is goodbye forever.” Champagne is passed around to toast new beginnings, and I wonder if this is what I have inadvertently signed up for — a ceremonial uncoupling from the anthropocentric past as we have known it. As our playlist reverberates around the cabin, Sinclair and Kronemyer return to their canoe, instructing audience members to empty a crate of potato chips onto them. As they drift away in the late afternoon sun, seagulls swarm, an enormous flock taking off from a nearby hill in a strangely beautiful image of human-animal cohabitation, a sign, perhaps, of the shape of things to come. Developed from choreographer James Batchelor and visual artist Annalise Rees’ two-month residency at sea aboard the RV Investigator, an Australian marine research vessel deployed to the barren Antarctic islands Heard and McDonald, Deepspace locates the bodies of its performers — Batchelor himself and Amber McCartney — “between extremities of remoteness and proximity, connectedness and isolation, certainty and uncertainty” [program]. 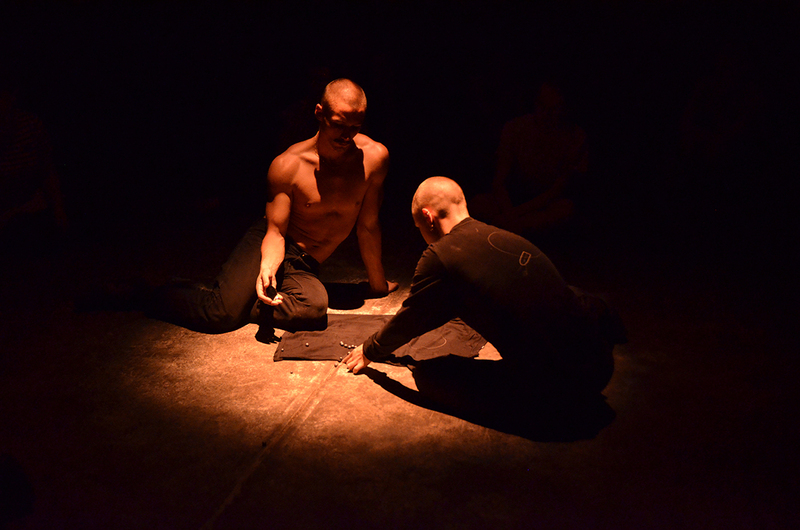 The work’s venue is the cavernous Hart’s Mill Flour Shed, within which the audience is able to move freely as the performance plays intriguingly with our sense of perspective, by turns demanding our full awareness of the space, and drawing us in for moments of deep intimacy as the dancers’ bodies themselves become sites of exhibition. The work begins with the dancers — both androgynously lean and shaven-headed — in the centre of the shed, hunched over as though fearful of taking up too much space. They uncoil in slow unison, then reveal palm-sized globes swirling through the air before gently releasing them to roll to the edge of the space’s concrete floor. Next, they begin a duet reminiscent of that old drama game in which two actors mirror each other’s movements as closely as possible, imperceptibly switching who is leading who at given intervals. The movement has an improvisational quality, the dancers — clad in head-to-toe black — alternatingly entwining and disentangling themselves from one another across both horizontal and vertical planes. Limbs nestle against limbs, relenting and pushing, as the dancers gradually spin out of each other’s orbits, Batchelor’s contemporary choreography taking on the more expansive movements of classical ballet. We discover the space with them, as well as the scattered objects with which they seem to be gathering spatial and personal data: a length of rope, tied to one wall of the shed and used as ballast for experiments in weightlessness; curious, sculptural props that one moment pin the dancers to the ground, the next act as conduits for a marbles-like game. All the while, Morgan Hickinbotham’s ambient sound design pulses and thickens without ever resolving into a discernible beat. In the work’s final, mesmeric sequence, the shed’s lights are switched off and a narrow wash of orange-coloured light illuminates the dancers, now back in their starting positions. We gather round as Batchelor removes his shirt and lies flat on his stomach, McCartney placing a handful of smaller versions of the globes along his spine. Arching his back, Batchelor sends the globes up and down, pooling them with exquisite physical control between his shoulder blades and in the small of his back. Eventually he allows the globes to spill out across the floor, a random constellation that seems to defy the dancers’ earlier attempts to bring a kind of order to the space. In a final, lingering image of personal and spatial oneness, Batchelor holds up a small mirror, reflecting light that suddenly seems golden, sun-like, onto McCartney’s face, dissolving its features. Despite its surfeit of ideas, and occasionally arch conceptualism, I found Deepspace to be a beautiful, quietly urgent provocation to rethink our relationship with the world as we both find and remake it. Founded in 2012 as a collaboration between Creative Directors Sam Haren and Dan Koerner and Technical Director Robin Moye, Sandpit is known for its experiential, technology-focused projects in both theatre and non-theatre settings. 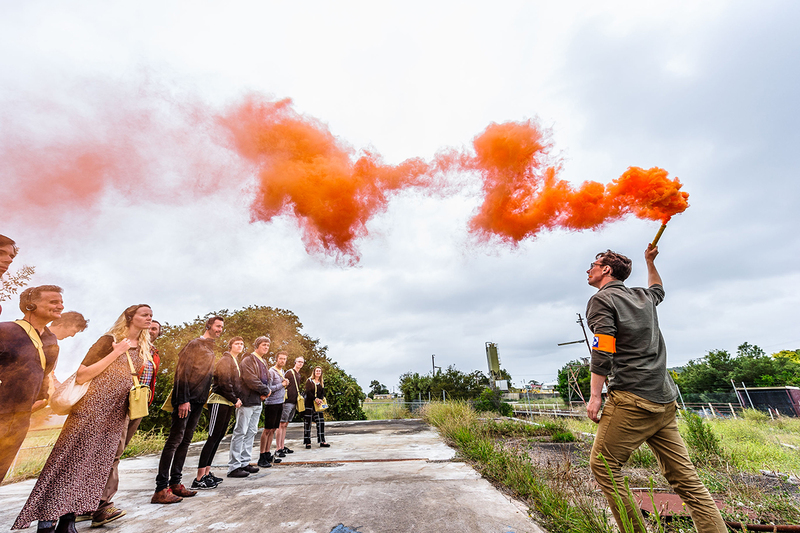 Its latest work, Eyes — the result of a three-year research project with the Digital Theatre Initiative, and first performed at Mount Gambier Fringe in 2017 — is an immersive audio recreation of a fictional apocalyptic catastrophe, “The Great Event,” in which a terrorist dirty bomb has triggered a nuclear disaster. A light drizzle is falling as we begin the tour but I don’t put on my poncho, feeling acutely conscious in a festival focused on climate change art of its wasteful disposability. We proceed among industrial refuse and abandoned railway tracks, Matt “deactivating” force fields and booby traps and guiding us across mutant-infested rapids, miming impeccably to sound effects triggered over Wi-Fi by an unseen stage manager (Lachlan Martin). Also on the tour is James (James Paul), the work’s technical manager and a target of Matt’s increasingly paranoid speculation. We’re led to a locked industrial building — Matt is in constant communication via walkie-talkie with one of his superiors, who believes a guard will let us in — but it’s unattended. Rounding the building, we find the guard, conjured via more miming and sound effects, who has been shot by a terrorist, and who Matt tries but fails to resuscitate (cue wincingly lifelike SFX of ribs snapping, flesh and blood squelching and slopping). The guard’s death, and an evermore ominous sonic landscape of distant gunfire and explosions, triggers in Matt a full-blown psychotic break. He rants about a conspiracy, and wrests a purportedly controlling implant from his own body. Despite an impressively committed performance by Jelk, and Woithe’s slickly evocative aural design, Rachel Perks’ text and the work’s narrative framing more generally, prove both confused and confusing. With little visual information to go on, the audience is often left to disentangle its layers, both meta and otherwise, diminishing our ability to stay fully immersed. Loose threads remain — what was the source of the voice I heard in my headphones at the tour’s beginning, and what narrative purpose did it serve? — while individual moments, such as Matt’s breakdown, defy interpretation. I wondered if it was real for him or a part of the tour’s simulative framework, a question with the potential to change my reading of the work’s representation of self and agency at the end of days. In the finale, Matt leads us to an empty field, setting off a flare and instructing us to put on our blindfolds. Emotive music swells in our ears as he speculates, in a long, existential monologue, on humanity’s place in the natural order, and our ultimate disappearance from it. “Apocalypse doesn’t mean the end,” he tells us, “but uncovering. An understanding.” In their divergent speculative futures, the works in Climate Century prompted new ways of thinking about what it means to live in the Anthropocene, a time of profound loss but also resistance and reinvention.